There is only so much lying on sofa a girl can stand, staring at a bare tabletop. Where is the Valentine's love? Not up to shopping for apples and construction paper, that's for sure. I'm glad that you are feeling better. Or, at least better enough to post. But wait, are you sick or is it your children? Or both? I can't remember and I'm not sure which is worse. We're all have the flu, but my case is much milder than the kids'. Oh, I'm sorry you've been so sick. Feel better soon. 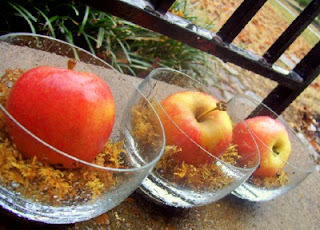 And those apples look great like that- you're so full of simple, yet beautiful ideas.